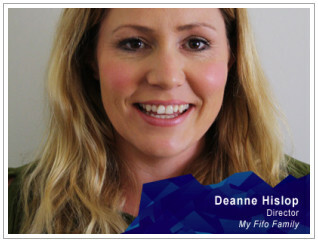 Deanne Hislop has been nominated for a People’s Choice Award in the WATODAY.com.au 2014 Entrepreneur & Innovators Awards in recognition for her dedication in the field of children’s resources and family support. From creating children’s calendar and books for her own children only 18 months ago, Deanne Hislop has created and grown My Fifo Family into Australia’s leading supplier of children’s resources for families with working away parents, supplying many of Australia’s largest and international resource companies and FIFO buy blood pressure drugs employers. My Fifo Family products now touch the lives of over twelve thousand families across Australia and New Zealand. To show your support for the dedication Deanne Hislop has made to the lives of Australian families along with her continual commitment to raise funds for a number of not for profit organisations and foundations that support the parents, children and mental health of employees within the resource sector please cast your vote. Show your support for Deanne! !